Matt Groening’s sci-fi spoof Futurama has come to an end (again), but it remains beloved in the eyes of its many fans. Futurama was not only one of the funniest cartoons of all time, but it could also prove itself surprisingly deep and intelligent. Often, it could provide powerful emotion, inspirational messages, and mind-bending sci-fi concepts that would put the best of drama to shame. The following are the top ten Futurama episodes that will uplift your spirit, break your heart, or blow your mind. When the subject of time travel comes up, certain theories are always mentioned, such as the idea that if you were to kill your own grandfather, you would prevent your birth and cease to exist. When the Planet Express crew is accidentally sent back to Roswell, New Mexico in 1947, Fry becomes obsessed with protecting the man he believes to be his grandfather. Being Fry, his efforts only lead to the poor man’s death. A confused Fry later finds himself comforting the woman he thought was his grandmother, and… one thing leads to another. In this episode, the professor creates a machine capable of producing two smaller but otherwise identical copies of anything. 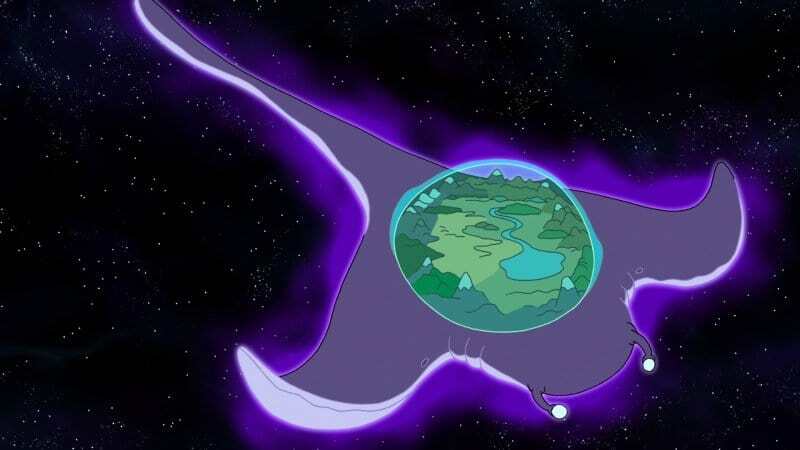 When Bender gets his hands on it, he uses it to create millions of micro-Benders to do his bidding, but they soon threaten all life on Earth by consuming the planet’s resources. What may surprise you is that this is based on a popular sci-fi concept that could actually be a legitimate concern for the real world. The so-called “grey goo” scenario predicts that the rise of nanotechnology may create a plague of self-replicating nanobots that would consume the entire planet. Many of Futurama’s best moments come as the result of Fry’s fumbling attempts to win Leela’s heart and the relationship that follows. Time Keeps on Slippin’ is one of the earliest examples of this. As Fry begs Leela for a date, an experiment of the professor’s rends the flow of time, causing it to randomly jump forward. One of these jumps sends the crew forward to Fry and Leela’s wedding, but because they have no memory of what happened between the jumps, they’re divorced immediately after. Fry is then desperate to discover how he won Leela over. He eventually discovers that he used a massive gravity pump to move the stars themselves to write her a cosmic love letter… only for his grand message to be destroyed by the sealing of the time rifts with Leela having never seen it. Professor Farnsworth doesn’t have a good relationship with his parents. They neglected him when he was a child, and now he’s consigned them to a soulless virtual reality retirement on the Near-Death Star. But the professor doesn’t have all the facts. He eventually learns that the reason his parents never had the energy to spend time with him is that he suffered from severe night terrors, and they had to stay up with him all night, every night, reading to him from science books to help him sleep. Touched by what his parents sacrificed for him, he reprograms their virtual reality to an idyllic recreation of the farm where he grew up, and they get to have the family time they always wanted. Overclocking a computer is a way to exceed its standard performance by pushing it beyond its recommended limits. Overclocking Bender is a bad idea. After being overclocked by Cubert, Bender becomes ever desperate for more mental power, eventually evolving into a godlike being with knowledge of all time and space. As is often the case, the real emotional punch of the episode comes from Fry and Leela. 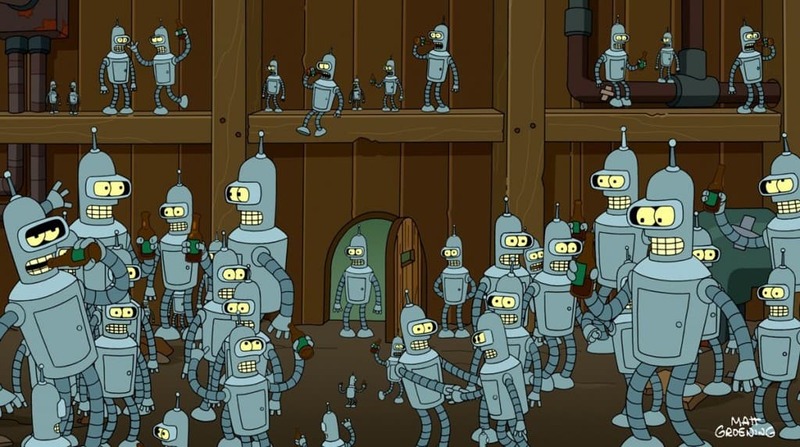 Before losing his powers, Bender predicts the entire future of their relationship. 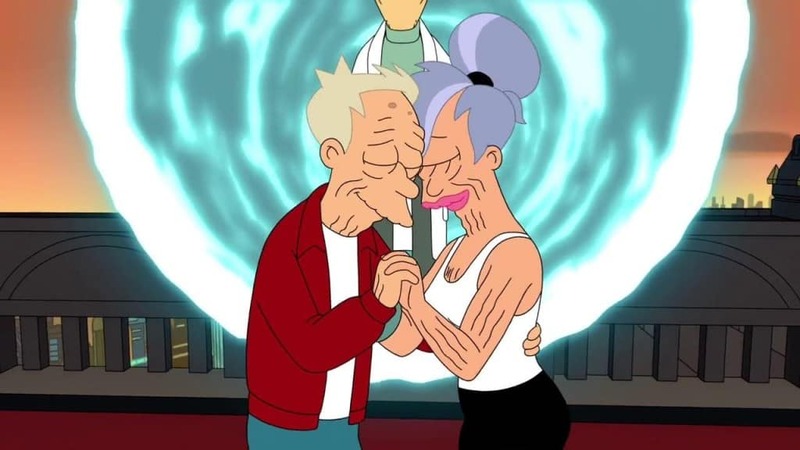 The viewer never sees what Bender has predicted, but Fry and Leela’s reactions run the entire gamut of human emotion, and in the end, they simply embrace. The last of Futurama’s direct to DVD movies and one of Futurama’s many endings, Into the Wild Green Yonder features the concept of “Green Energy,” the source of all life in the universe. The ebb of Green Energy has caused every mass extinction in history, but now it’s flowing again. The search is on to find the last survivor of the Encyclopods, an ancient race who incoporated the DNA of every extinct species in history into their own genetic code. With an Encyclopod and the Green Energy flowing, a new and wondrous Green Age can be ushered in for the universe. Though it is presented as a silly romp full of oddball characters and intergalactic mini-golf, the epic and ecologically conscious story of Into the Wild Green Yonder could have worked just as well as a serious sci-fi drama. The most recent of Futurama’s many last ever episodes, Meanwhile, sees Fry finally ready to pop the question to Leela. His idea of a romantic evening is to use a button of the professor’s that turns back time ten seconds to allow the perfect moment of Leela accepting his proposal to last indefinitely. Of course, things go horribly, horribly wrong. Fry ends up breaking the button, and the entirety of time with it. The entire universe is frozen, with only he and Leela spared. But it’s not as unhappy an end as you might think. Fry and Leela spend the rest of their lives in an endless honeymoon with the frozen universe as their playground, and in the end, Leela says that despite it just being the two of them, she never felt lonely. When an alien vessel bombards Earth with a destructive sonic pulse, only Fry recognizes the sound, but he can’t place where he heard it. The only hope is to travel into Fry’s memory to try to determine what the sound is. But Fry isn’t focused on the mission. He’s determined to treasure his last chance to spend time with his family from a thousand years in the past, even if it is just a memory. In the end, Fry saves the world again, and earns the gratitude of the powerful Nibblonians in the process. That night, Fry once again finds himself confronted with the image of his mother, but he laments that it’s just a memory. Then, Nibbler appears to tell him that this isn’t his memory — it’s his mother’s. Just before the credits roll, we see Fry’s mother sleeping back in the 21st century, and she smiles. 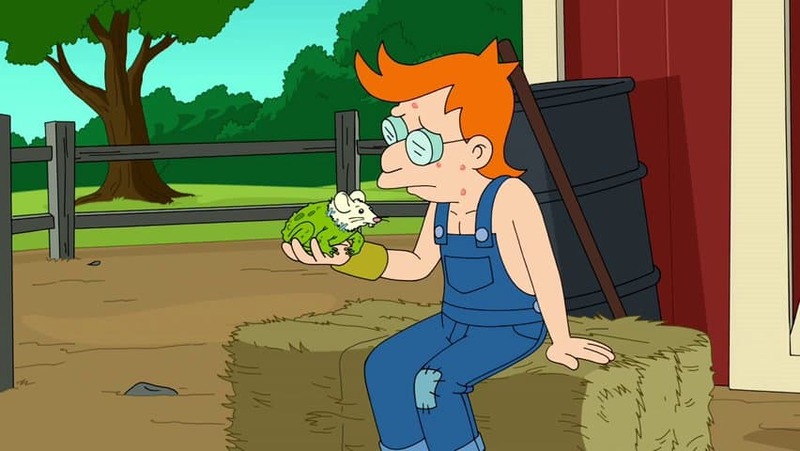 This is another example of two of the things Futurama does best: time travel shenanigans and touching our Fry/Leela feels. Late for a date with Leela, Fry is pressed into helping test the professor’s latest invention: a time machine that can only go forwards. But of course, it goes wrong, and they wind up hundreds of years into the future. Their only hope is to keep going until they find a time where a two-way time machine exists… but they never find one. 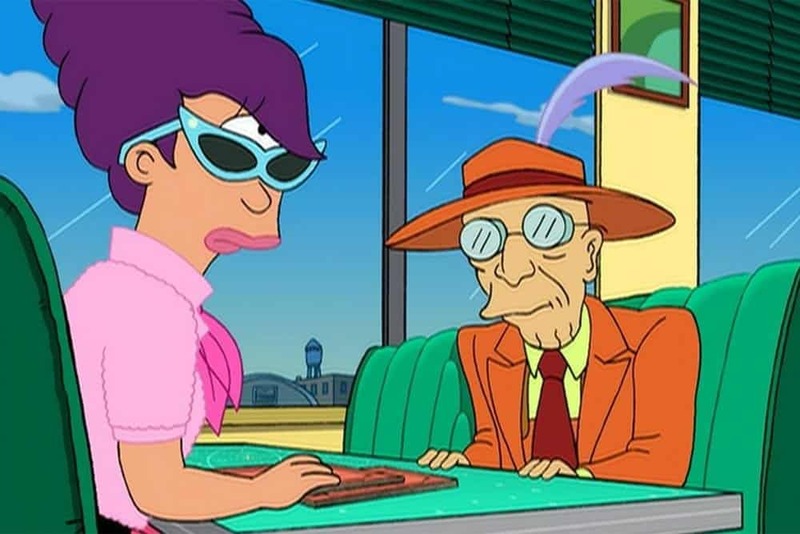 The episode hits its emotional climax as an aged Leela finds her way to the ruins of the Cavern on the Green restaurant, where she was to meet Fry before his disappearance. She uses her laser pistol to blast a seemingly random series of holes in the roof, and as she leaves, water begins to drip from them. Over billions of years, the dripping water forms stalagmites that form a loving message for Fry, and in the dying days of Earth, he finds it. If this doesn’t move you, you might want to see a doctor about that missing heart. After making the mistake of taking a nap in a torpedo tube, Bender is shot into deep space, doomed to drift forever. He soon has company, though, as a race of tiny aliens colonizes his body and come to view him as a god. Bender quickly realizes being god isn’t easy. No matter how much or how little he answers their prayers, he only makes matters worse, and soon, the creatures destroy themselves in a holy war. Soon after, Bender encounters a cosmic being who claims to be God, or something very much like it. 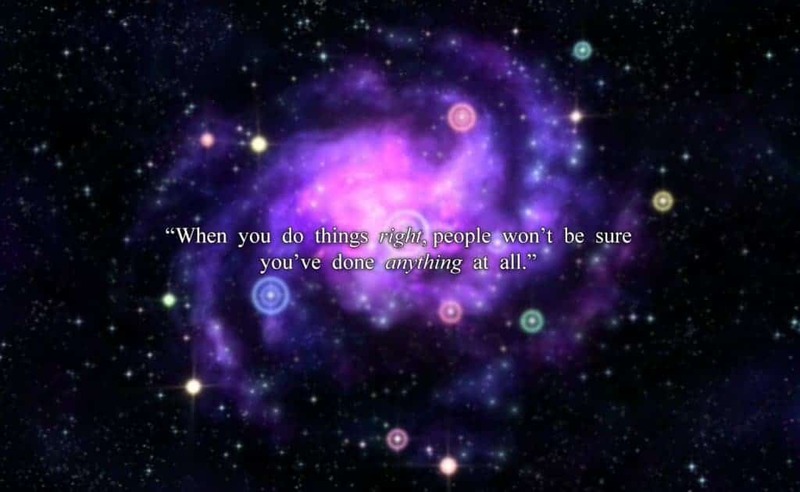 “God” says the trick is, “When you do things right, people won’t be sure you’ve done anything at all.” He later uses Bender to demonstrate this principle, though of course no one’s sure that’s what he’s done. The brilliant thing about this episode is how much it makes you think about religion — both its virtues and its follies — and how God might actually operate, if such a being exists. Whether you’re an atheist or a believer, it’s bound to make you think.